Batters up! Hear that call! Alyna - 2 years old as Dottie and Liv - 8 months old as Kit! 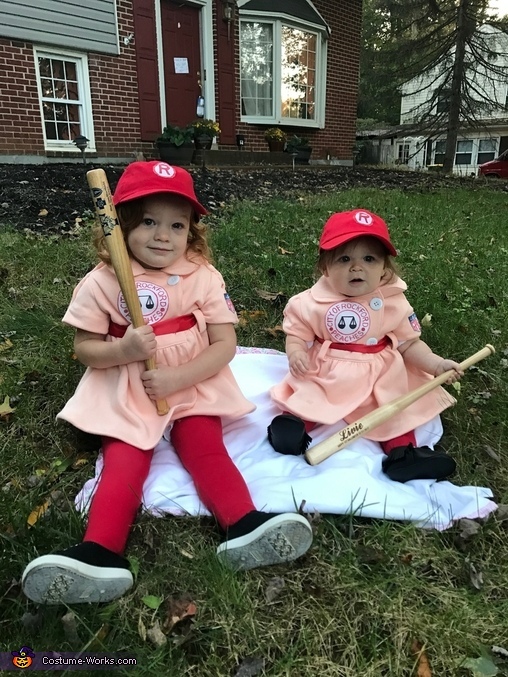 Marjorie and Tiffany, alyna and live moms, love Halloween and have made many great homemade costumes in the past throughout their college days :) now we are passing the tradition of homemade costumes to our daughters! Made the costumes by cutting 2 cheap peach jackets. Hemmed the edges and cut the sleeves and hemmed and added belt loops and white buttons to create the look. Used a red plain ribbon for the belts and drew the patches with fabric marker. Made patches for the hats by drawing with fabric marker too!